In just over 12 hours, the new destination for first run British drama and comedy in Australia, BBC First launches on the Foxtel platform on channel 117. The channel will launch at�9.30am on Sunday 3rd August and will be available in HD and on also Foxtel GO. The new channel joins existing BBC Worldwide channels on Foxtel, including UKTV, BBC Knowledge, CBeebies and BBC World News. The key selling point of the new channel is the first run window it has to broadcast new BBC drama and comedy content to Australian audiences (i.e. a Foxtel rather than a free-to-air premiere). �Even before its launch BBC First has had a win by signing German luxury car maker Audi as its launch partner. While BBC channels in the UK do not run advertising (like the ABC in Australia), BBC Worldwide is the commercial arm of the BBC and runs advertising on its business units around the world. BBC Worldwide have 40 channel feeds in 123 territories�and in 2013/14 (according to the�BBC Worldwide Annual Review 2013/14)�had headline sales of��1,042.3m (A$1,882.63 m). Audi has signed a six month partnership with BBC Worldwide and, according to the press release, Audi will have a prominent presence on screen and online. 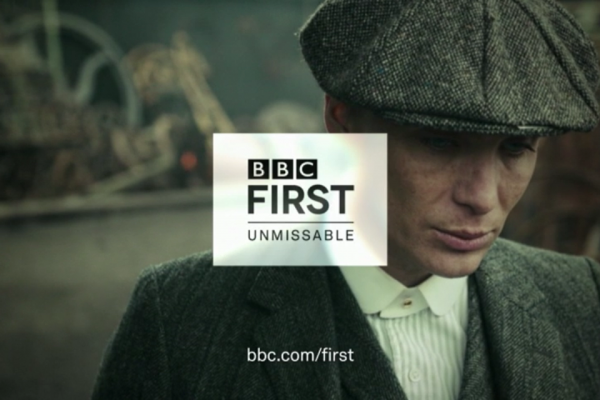 The package includes�exclusive sponsorship of Sunday evenings on the channel, as well as shared sponsorship of Mondays and Thursdays, featuring programs including The Musketeers, Peaky Blinders and The Honourable Woman.� Other bespoke channel assets include launch sponsorship idents and Audi on air branding. The Musketeers��a thrilling world of action, adventure and romance inspired by Dumas� legendary characters, starring Luke Pasqualino, Tom Burke, Santiago Cabrera, Howard Charles and Peter Capaldi. Peaky Blinders�� acclaimed epic gangster family saga set in the lawless streets of post-war Birmingham on the cusp of the 1920s, starring Cillian Murphy. The Politician�s Husband�� a gripping drama about the shifting balance of power in a political marriage, starring David Tennant and Emily Watson and created by Paula Milne. Burton and Taylor�� starring Helena Bonham Carter and Dominic West and telling the story of Hollywood�s original �it� couple Elizabeth Taylor and Richard Burton, acting together in Noel Coward�s �Private Lives�. Alan Partridge�� his two new mockumentaries�Welcome To The Places of My Life�and�On Open Books With Martin Bryce, starring Steve Coogan. The Fear�� a bold edgy drama starring Peter Mullan as a former crime boss whose empire is brought to its knees by the disintegration of his criminal mind. Breathless�� following the lives of a group of doctors and nurses working in a busy gynaecology unit in a London hospital in the 1960s. BBC First’s launch ident will be based on�the theme��The Best Stories Come Down To The Details�.